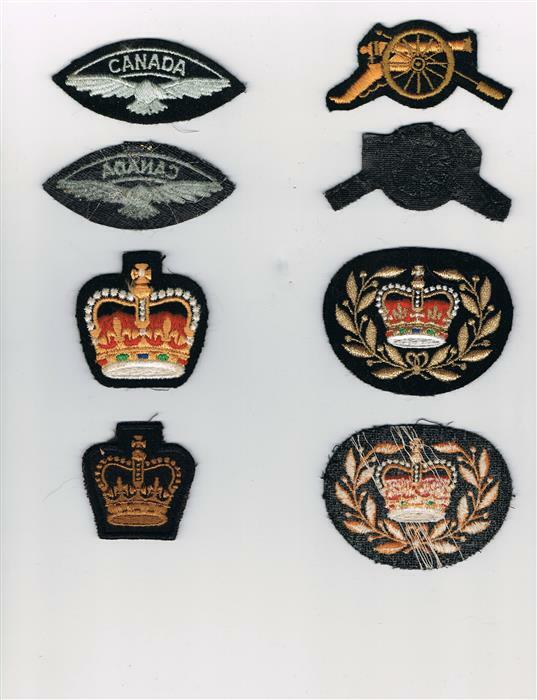 Hodge Podge of ranks and other insignia 80's era? Well it seems odd for me to post these up like this, but I was going through a bunch of odds and ends and came across the following items. Most of it is of little or no interest to me, and it certainly begs the question, where did I get this and why?? It is all quite a mix, covering Army, Navy and Air Force. I think the Eagle patches are Air Cadets owing to the colour, white on black? 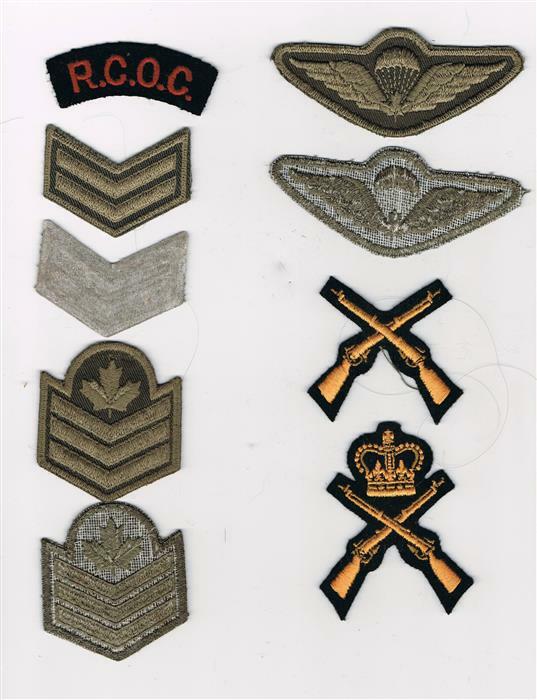 Re: Hodge Podge of ranks and other insignia 80's era? Hi Cliff, If I understand your post, these are for trade/sale? I would be interested in the combat parachute qualification wing and the Genie du Material Terrestre/Canada. Hello Bill, for you, certainly. I will bring them to the show in Ottawa on the 27th... oooops I mean the 26th. The combat para wings are interesting, never seen that pattern before, appears to be same style as the combat boonie hat badge. Looks similar to the garrison style. Hi Mike, I have no idea about those wings. I am sure Bill knows more about them. As for that matter, I am hard pressed to figure out when and what most of the cloth items are that I have accumulated over the years. I believe the wings are the initial trial subdued para qual from the early/mid '70's for wear on the combat uniform. 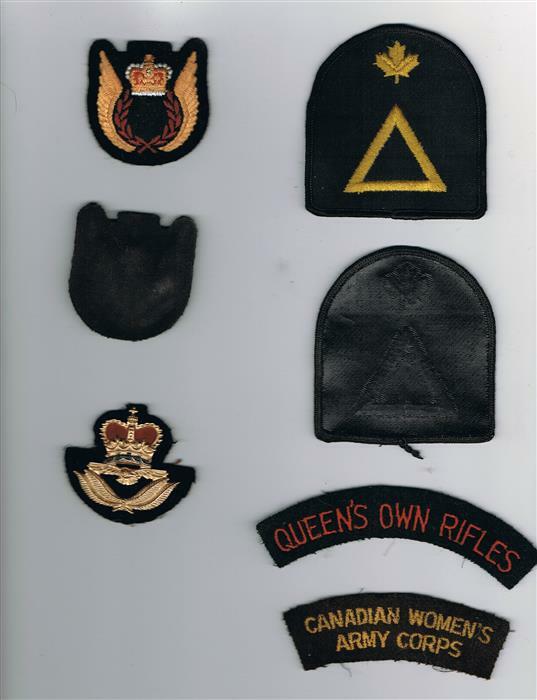 Never adopted, and according to Lou Grimshaw, in his book on Cdn para wings, a bunch were handed out to Brit jumpers when they were here for an exchange jump. The rest were snatched up. The later versions are as we all know them, on a rectangular piece of OD twill with an embroidered border. Bill, you are one lucky son-of-a-moose. Cliff, would you be looking for ID on the rest, or just putting them out to see who's interested. Like Bill, the only one I was interested in was the set of wings. Oh well....you snooze, you loose!! Isn't the son of a moose a moose? Yes, it is a piece I need for my collection as well. Ian B wrote: I believe the wings are the initial trial subdued para qual from the early/mid '70's for wear on the combat uniform. 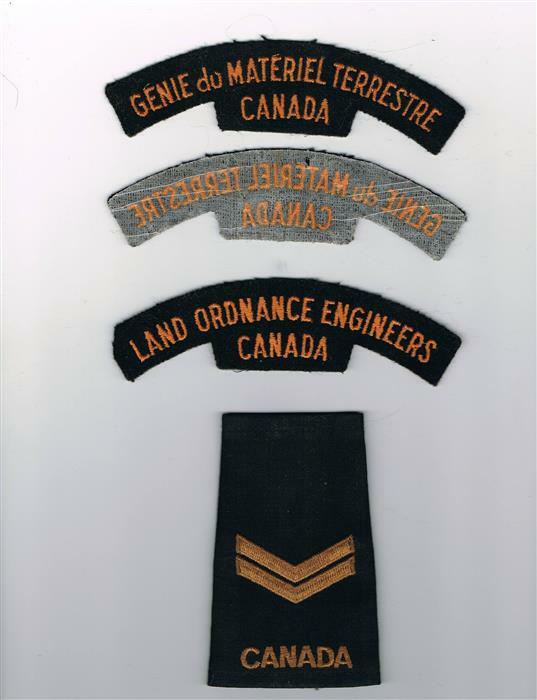 Never adopted, and according to Lou Grimshaw, in his book on Cdn para wings, a bunch were handed out to Brit jumpers when they were here for an exchange jump. The rest were snatched up. The later versions are as we all know them, on a rectangular piece of OD twill with an embroidered border. Bill, you are one lucky son-of-a-moose. Hello Ian, and all who have replied to this topic. I originally posted these as I am unable to positively identify them. Meaning era and use primarily. For example, I know the rank insignia, but not their usage. I think likely worn on combats during the 80's. All this is outside my collecting area. I was searching around the internet looking to see what I could ID and came up pretty much empty. It is difficult to find information when you don't know what to look for. It seems to me this era is lacking in documentation. The French and English LORE titles fit into my EME/GEM collection, but that is about it. I have not decided what I want to do with these. In the end some may well be offered up. Just to clear the air, my reason for accepting Bill's query is a personal one. OK Cliff, hope this helps. I'll go in picture order and from top to bottom, left then top to bottom right in the picture. Aside for Bill. Yeah you're correct. What's a female moose called? Except if she's married, then she's a Meeses. As in "Meeses Moose"
Except when they are road kill, then it is Stew.